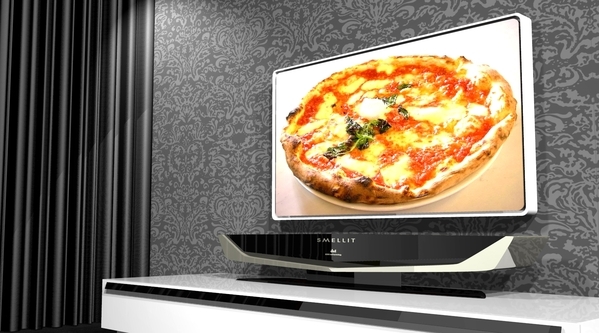 IPTV Blog - IPTV Magazine: Broadcasting Smells with TV Programs? Broadcasting Smells with TV Programs? Sending smell through a TV system may be coming soon. The designer Nuno Teixeira has figured out how to use inkjet printer technology with digital scents to allow TV programs to be enhanced by smell. Imagine you are watching a romantic movie where the couple is sharing a special dinner at a charming restaurant. In addition to the amazing video and surround sound, you can also experience the “smell of love”. About 10 to 20 seconds prior to the enchanting dinner experience, the room fills with the aroma of Italian cuisine, possibly pasta in wine sauce, fresh bread, and what kind of cheese is that? According to Nuno Teixeira, your TV is linked to a special type of printer. Instead of printing on paper, it sprays just the right amount of scent to enhance the viewing experience. Each cartridge contains a “smell gel” concentrate. When the gel is released, a fan in the printer distributes the smell throughout the area. Cartridges can be replaced in a similar way that inkjet cartridges are replaced (refills for beer smell anyone? ).